When you become a ReceptionMagazines.com Sales Affiliate, you'll join one of the easiest and highest paying affiliate programs on the web. If you have a Web site (or even an e-mail account) you can sign up and start generating sales commissions almost immediately. 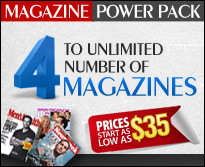 Sell over 1,200 of the most popular magazine subscription titles. Earn a 20% commission for subscriptions which are purchased from affiliate links to ReceptionMagazines.com. Get 60 return days for each customer, which means if a buying customer returns within 60 days to make another purchase then you will receive the commission. Receive monthly payments directly through Paypal. NOTE: you must have a valid Paypal account to receive payments. To begin earning money as an affiliate sign up now.